This is a blend of spices you can use in place of packaged taco seasoning–and it tastes so much better! I make this mix then put it in a small glass jar so I have it on hand when I need to spice up Mexican dishes or other things like omelettes and popcorn. NOTE: this is enough to mix up and store. You’ll only need 1-2 tsps of it for this recipe. In large bowl slightly mash the chickpeas, leaving some whole or in large chunks. Mix in scallions, tomato, red pepper, kale and corn (if using). In separate small bowl, mix all the ingredients for the dressing together. Mix in 1/2 cup of the dressing into the chickpea mixture and stir well. Then mix in 1 tsp of the Vogue Vegetarian Mexican Spice Mix and stir until well combined. Taste and if needed, add the extra tsp of VV Mexican spice mix. Mix in a few dashes of pepper to taste. Lay out a flour tortilla and spread with a little of the left over dressing (and hummus if you’d like). 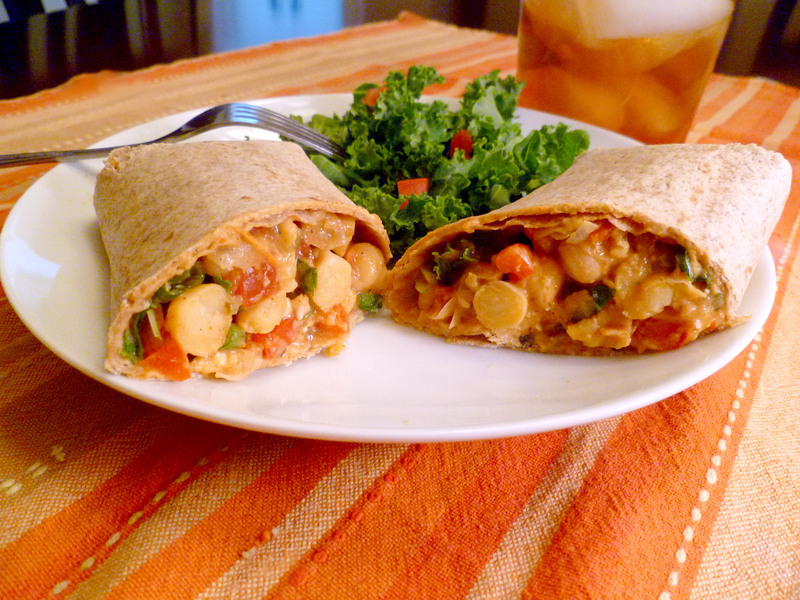 Fold in the ends then roll into a wrap, cut in half and enjoy! This is very versatile. If you don’t have these veggies, feel free to substitute with other Mexican-inspired veggies or whatever you have on hand! If you include cheese in your diet, this is also fantastic with a few tablespoons of feta cheese mix in. I am oh so very glad that you stopped by my blog and left such a lovely comment. Thank you, because I am so glad to have discovered this amazing little corner of the internet. I am a new vegetarian – as of 26 December, and although I adore vegetable meals, its *always* nice to get some extra inspiration! At the moment, I am totally crushing on chick peas, lentils and quinoa. Thanks for all the time you’ve put into this blog – even though you are a busy mama. I’m sure we’ll be hearing from each other soon! Your blog is gorgeous and you take amazing photos! I could actually smell the outdoor air and the delicious food on the table in your date night shots. It instantly made me want to be there with my husband and I realized its been too long since our last real date. I love photography that can move you like that. Welcome to the vegetarian lifestyle! I am completely in love with eating this way and I can spend all day just talking about it. The toughest thing I have found about this lifestyle is that there is quite a bit of preparation and time involved… especially when we are so used to fast food, etc. But the payoff is huge. My family is so much more healthier, vibrant and happy. My husband has gained control over depression and anxiety and we have drawn closer as a family as we prepare and eat delicious meals that are good for our body and soul. The changes are so profound, I will never look back. I hope you enjoy it as much as I have and I look forward to staying in touch. Keep up the good work! Cheers! These look fantastic, I bet if I made them the night before and took them into work they would be incredibly tasty! How on earth do you get the time to make, photograph and then post and write about such gorgeous dishes so often! Awesome – I’m always looking for a new way with chickpeas. I like the spice mix as well. I like having specialized mixes on hand and making my own means I know if there is salt in there or not. so amazing! i have been experimenting with / transitioning to a vegan diet this year and your recipes are some of the best i have found. thank you so much for sharing! i made this last night for the first of what i am sure will be many times. i used the pioneer woman restaurant style salsa for the dressing mix (since i always have a pretty fresh batch on hand), and it is delicious. i would check it out if you are looking for a new salsa recipe to try! thanks again – looking forward to trying more!! Wow, thanks for the compliment! I am honored to have you try these. I will definitely check out that salsa recipe and maybe make a few changes to this one so it includes that. Thanks for the tip and thank you for the nice comment!